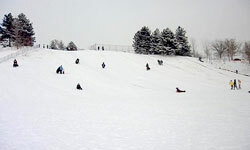 Hills for Sledding and Snow Tubing during winter months. El Monte Golf Course is a 9-hole classic parkland layout situated at the mouth of Ogden Canyon. The significant feature of the golf course is a pair of large Fremont Cottonwood trees that are in the middle of the first fairway and the historic clubhouse. The golf course is suitable for beginners and can be challenging for the very skilled player. The stone clubhouse sits 80 feet above the golf course and offers beautiful views of the golf course and canyon. The clubhouse was built during the Great Depression with stone that was quarried down by the Ogden River and is one of only 13 golf course clubhouses in the country that are recognized on the National Register of Historic Places. El Monte Golf Course has hosted the popular El Monte Four-Ball Tournament annually on July 24th since 1936.